These projects and results are depictions of my own personal experiences. 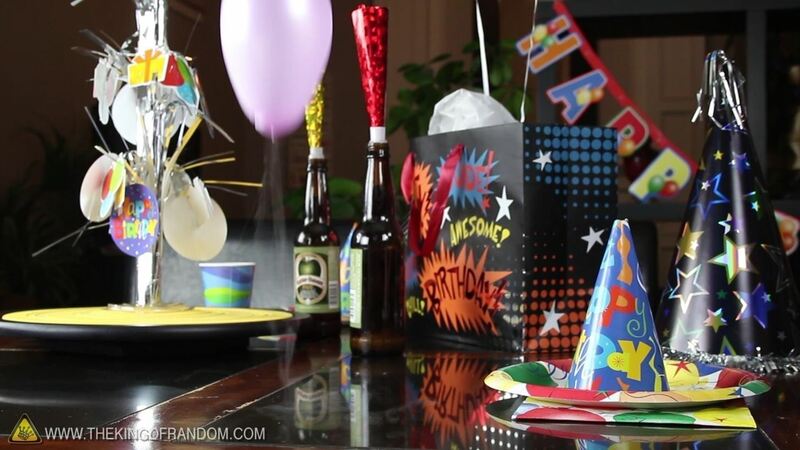 Your results may vary depending on your location and modifications to project ideas. There may be risks associated with some of these projects that require adult supervision, and possibly others that I'm not aware of. 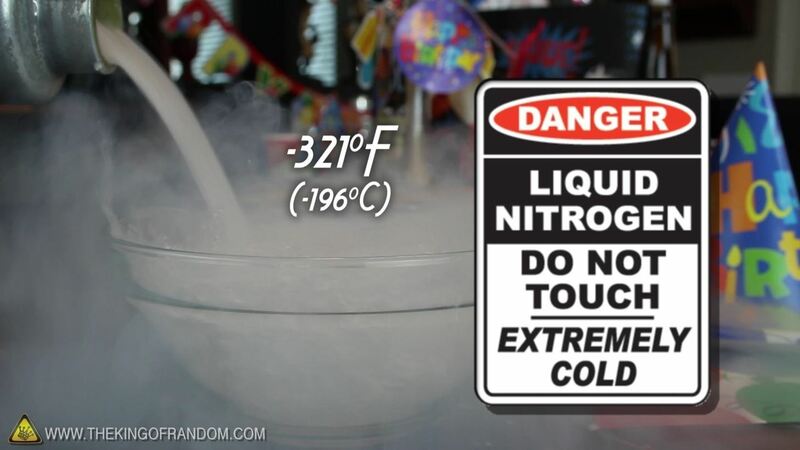 Liquid nitrogen is -321°F and can cause sever tissue damage and serious damage after prolonged exposure. 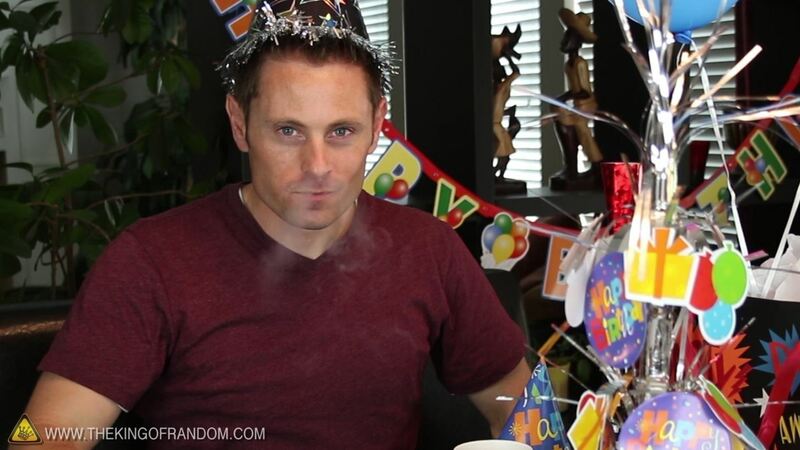 Use of this video content is at your own risk. 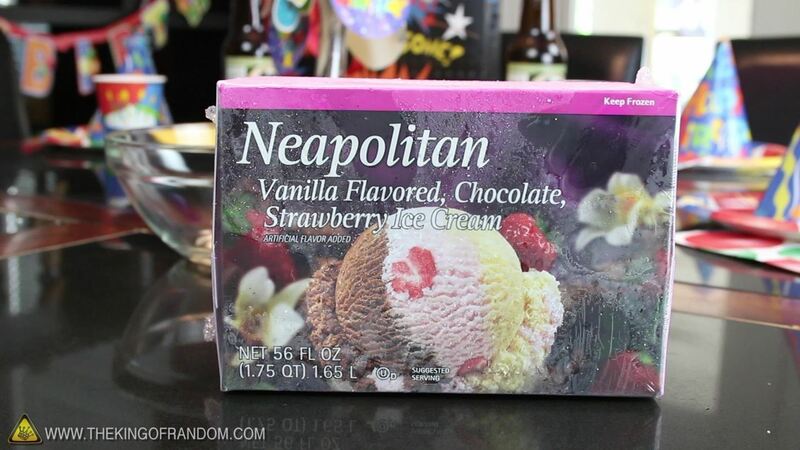 Get out your container of liquid nitrogen, and grab a box of Neapolitan ice cream. 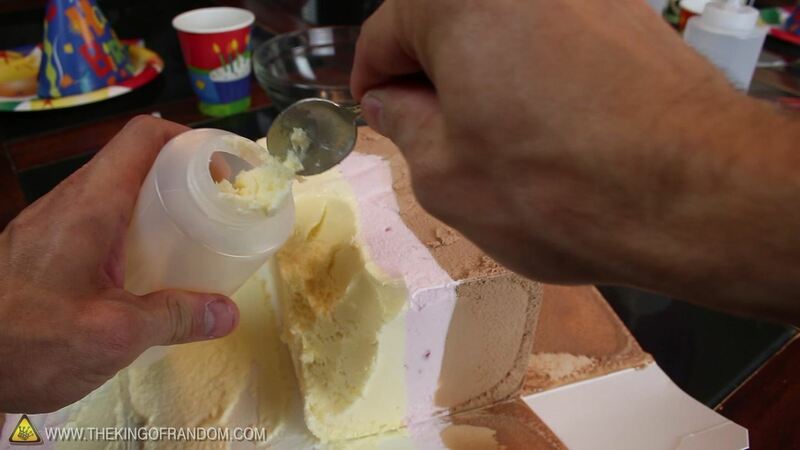 This is the type of ice cream that has 3 flavors in one, so go ahead and separate the colors into different containers, and give them a couple of minutes to melt. 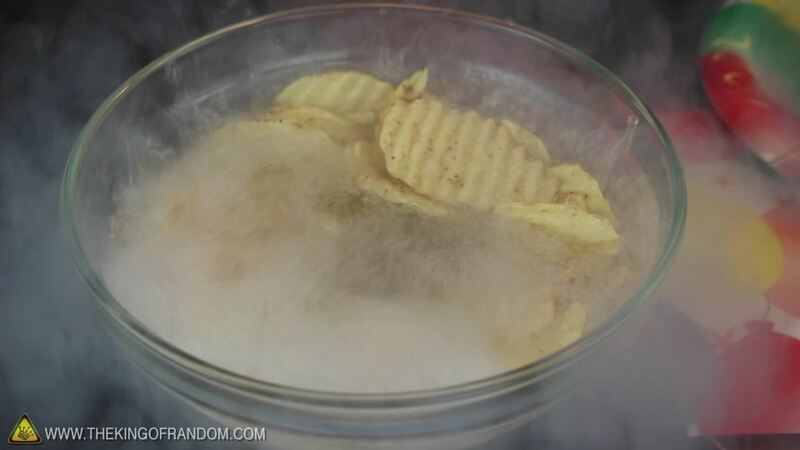 In the meantime, we'll need to fill a bowl, with liquid nitrogen. 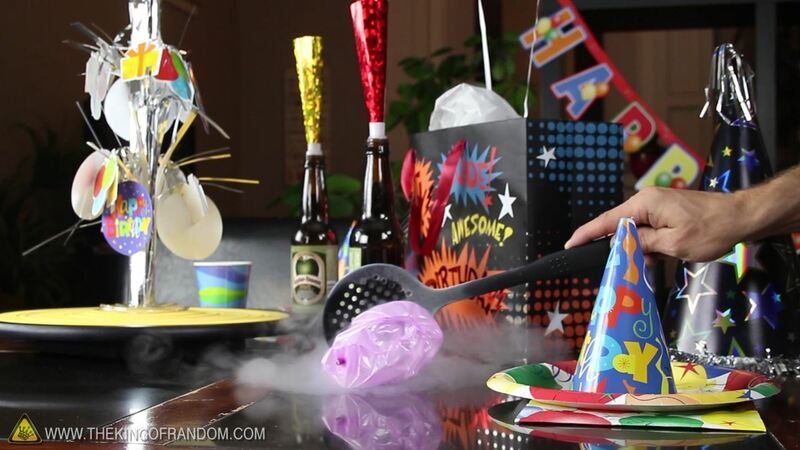 This stuff is -321ºF (-196ºC), which means it well below the freezing point, of your party guests. 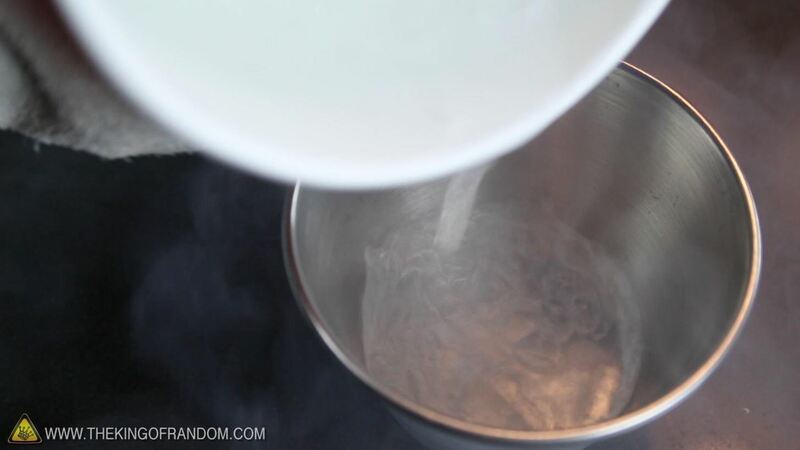 Now if you try dripping your flavors in, one drop at a time, you'll notice they instantly bead up and freeze solid. When you've got all the flavors you need, simply scoop the tasty pellets into a serving bowl, and voila! 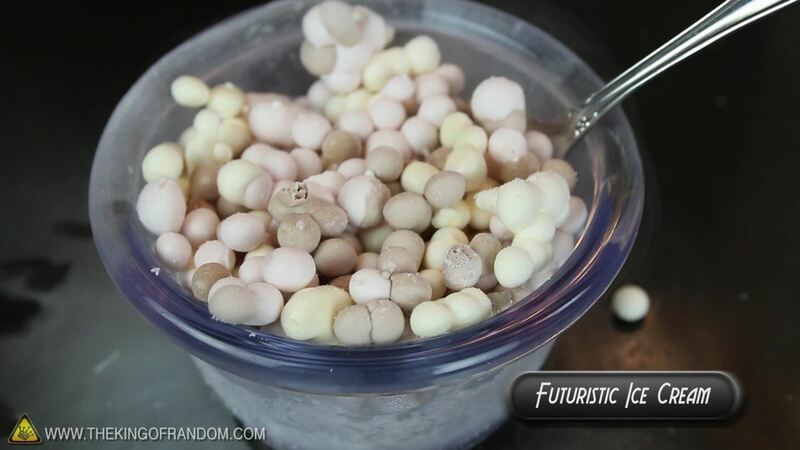 You've got a futuristic ice cream, ready to serve and enjoy. 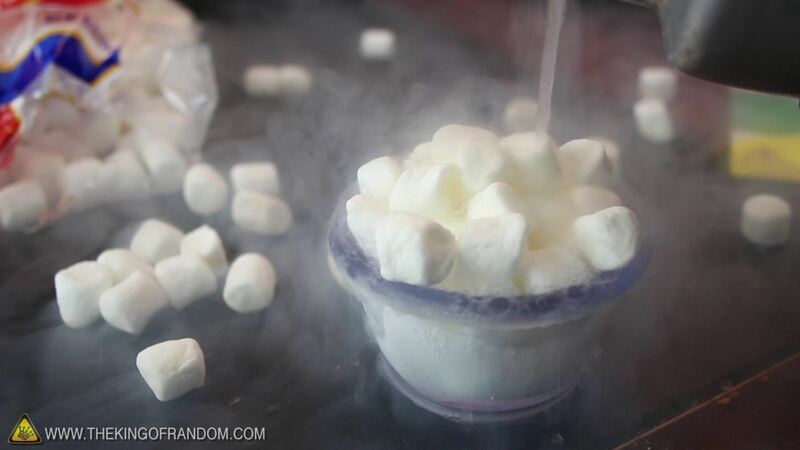 Load up a bowl with mini marshmallows, and sprinkle liquid nitrogen over the top. 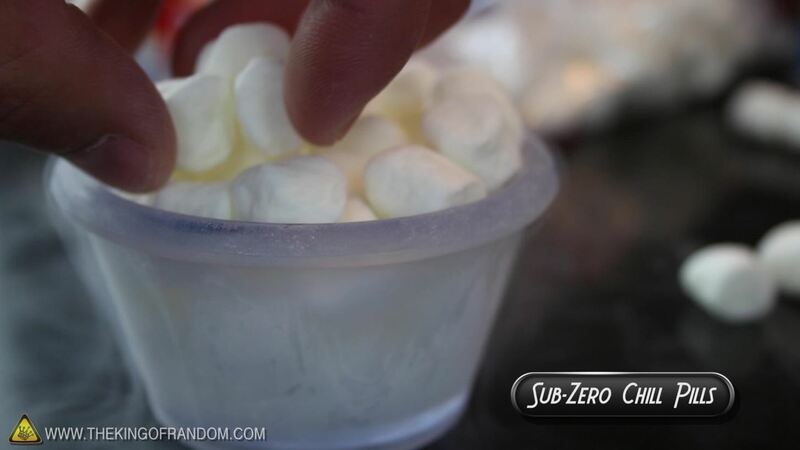 The marshmallows should freeze instantly, but go ahead and let them soak for about 30 seconds just to be sure. 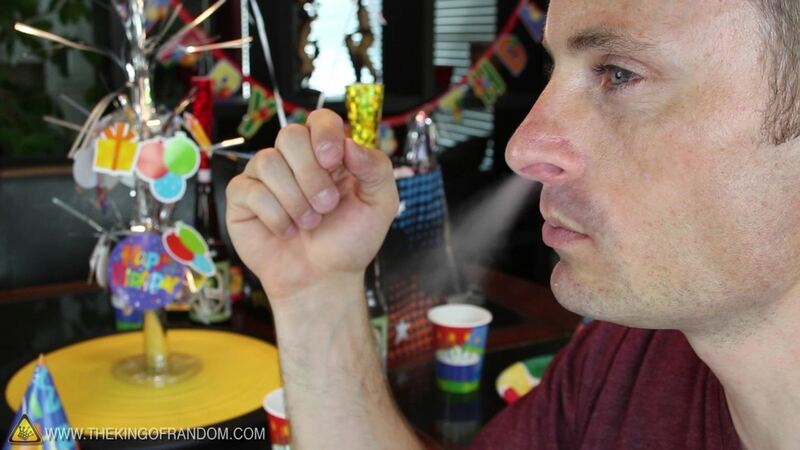 The end result is a sub-zero "chill pill" that's perfectly fine to eat, and lets you see your breath when you crunch into it. 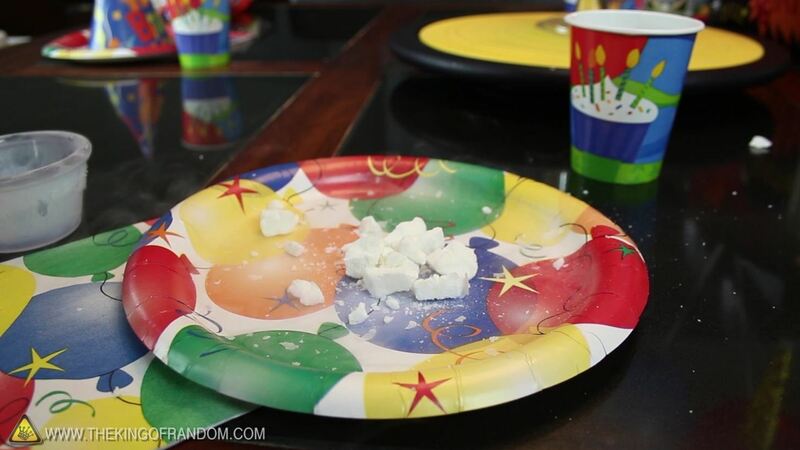 Now, if you flash-freeze a larger marshmallow, rather than eating it, try placing it on a plate and giving it a smack. It'll shatter into a thousand pieces. 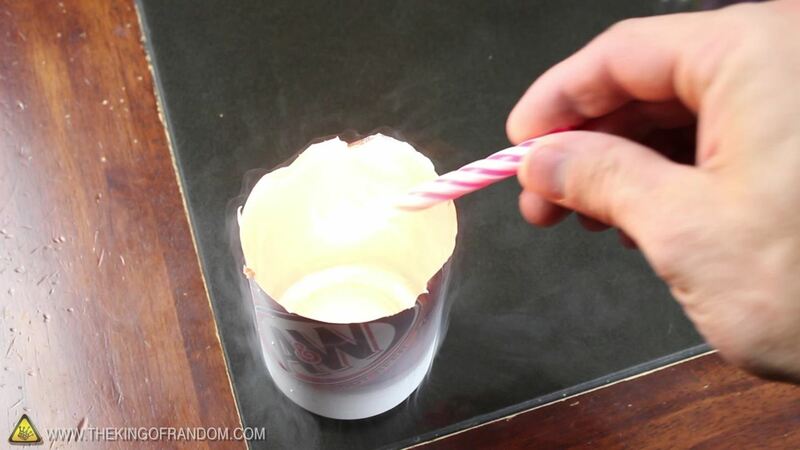 For this trick, you'll need a glass bottle with a narrow neck and a party horn with a little hot glue added around the bottom. 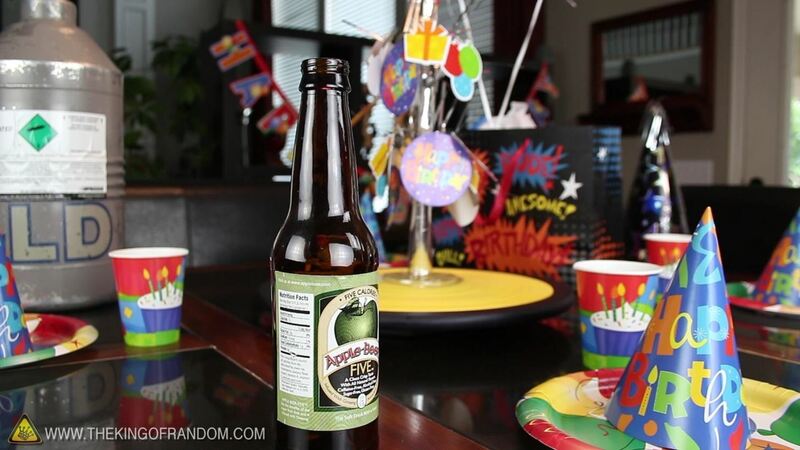 When it gets placed in the bottle, it should make a nice, snug fit. 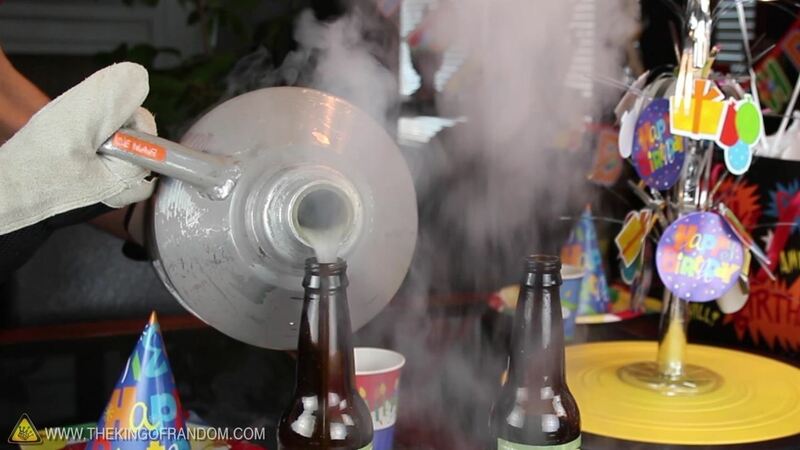 Now carefully pour the liquid nitrogen so the bottle is a quarter full, followed by a shot of hot water. 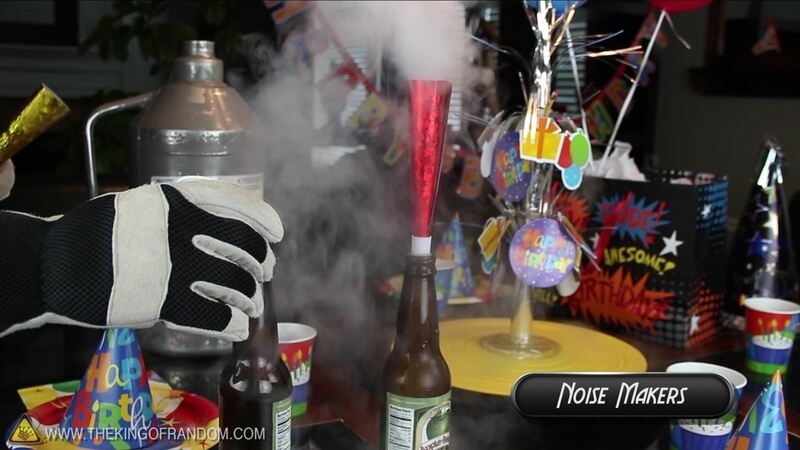 You can see that when the horn is pressed into place, it becomes a crazy noisemaker, that blows all on it's own. 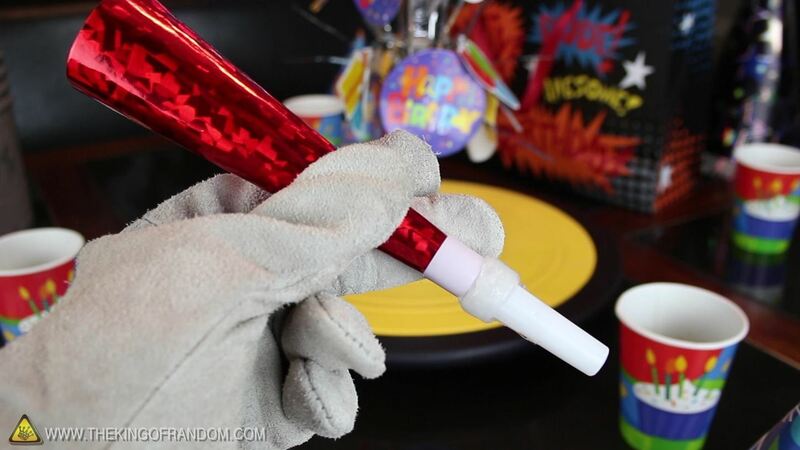 If you get a few of these going, you can really make some noise. 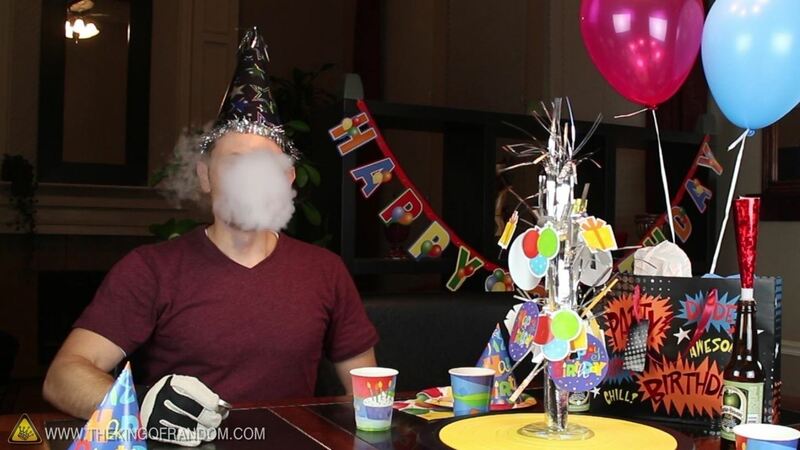 When there isn't enough pressure to keep the horns going, add some more hot water to the bottle and place a balloon over the mouth. 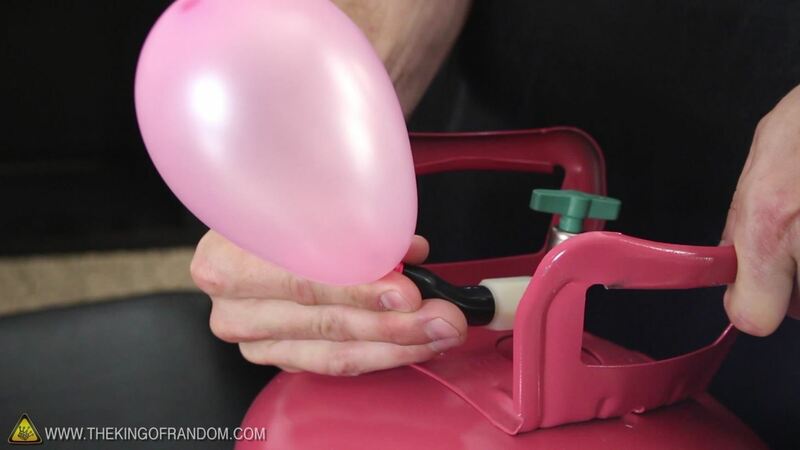 There will still be enough pressure to inflate the balloon all on its own. #5. 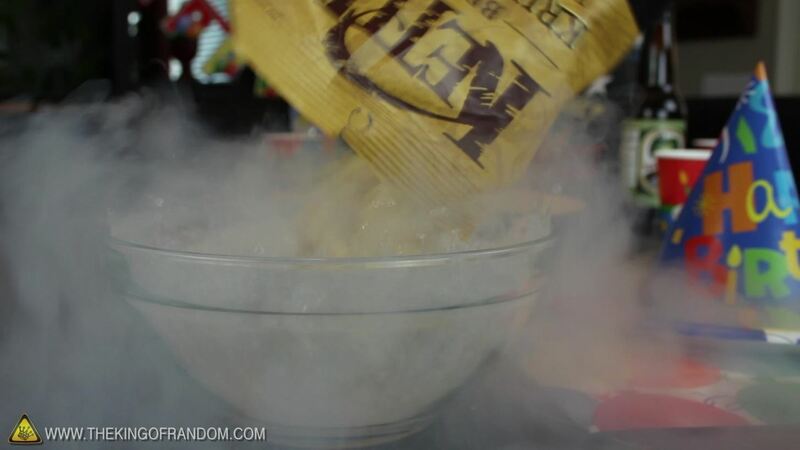 Chips That "Bite Back"
Find a bag of your favorite chips, and dump them all into a bowl of liquid nitrogen to sit for a couple of minutes. 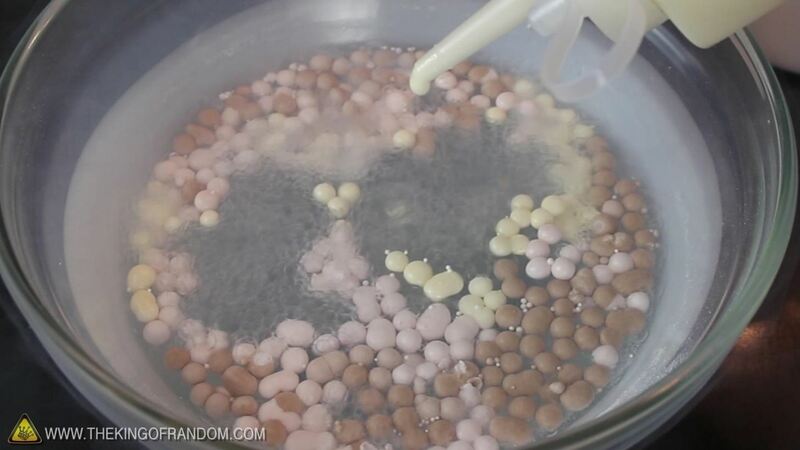 Now, it may look like they're boiling, but they're actually being cooled to a ridiculously low temperature. 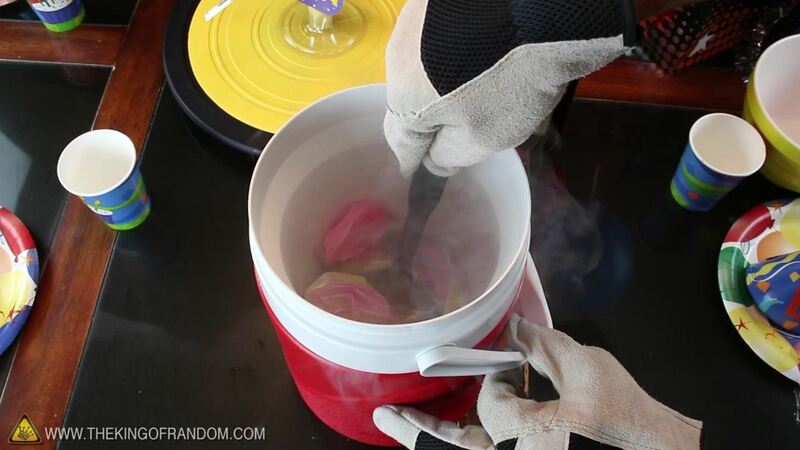 When the boiling stops, feel free to scoop them out, and onto a plate for serving. 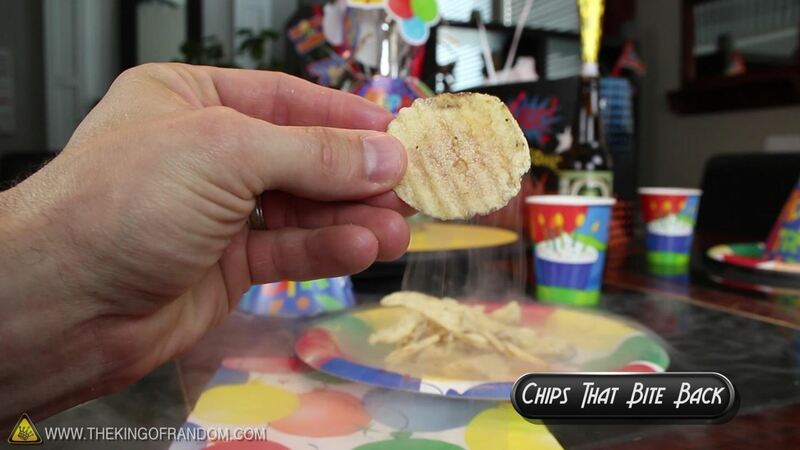 If you try eating one of these right now, you might feel a sharp sting on your tongue, like the chip is trying to bite you back. But if you give them just a minute, then try chewing with your mouth closed, it should take your chip eating experience to a whole new level. 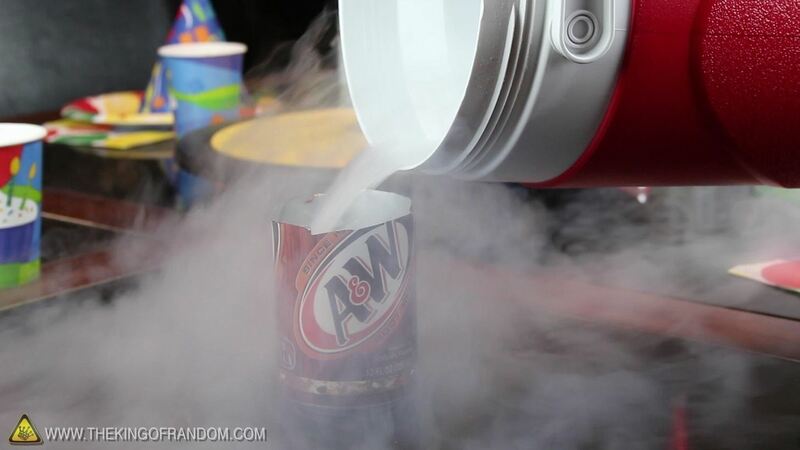 Cut the top off an empty soda can, and fill it up with more liquid nitrogen. 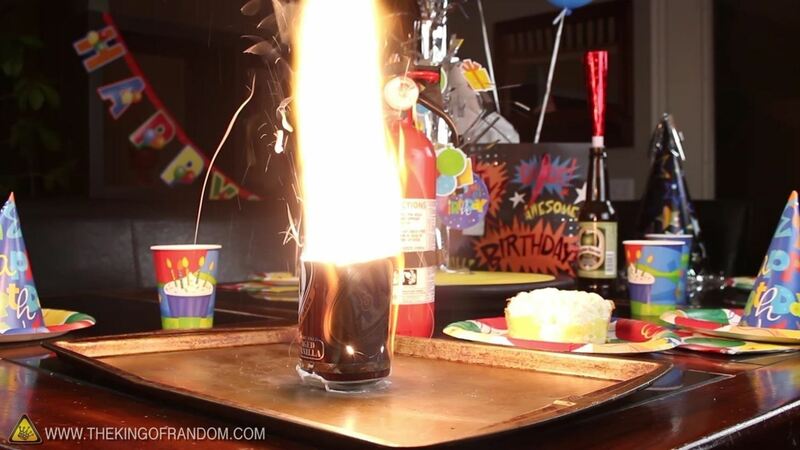 You can see that holding a flame into the can will make it go out. 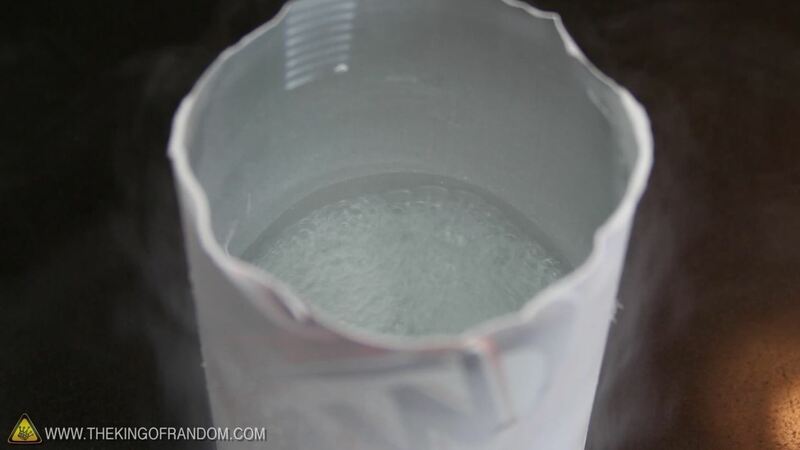 But if you let the can sit for a few minutes, the extreme cold, will pull oxygen out of the air and trap it at the bottom. 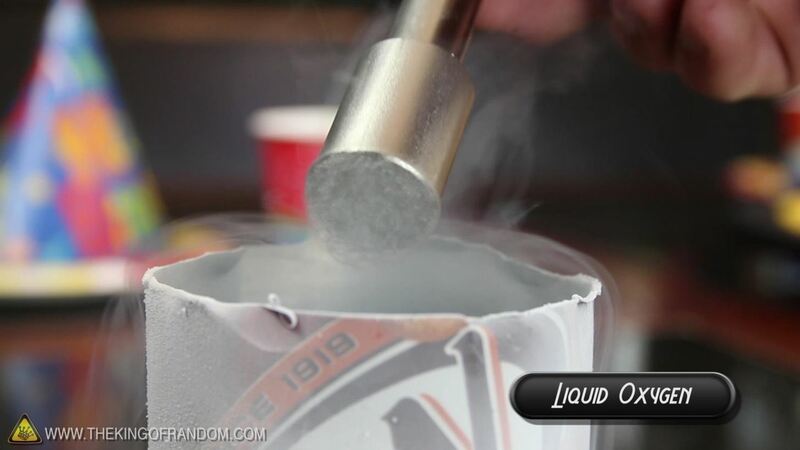 Now try dipping a super strong magnet into the liquid, and when you pull it out, you'll have liquid oxygen stuck to the bottom. At least until it warms up and boils off. 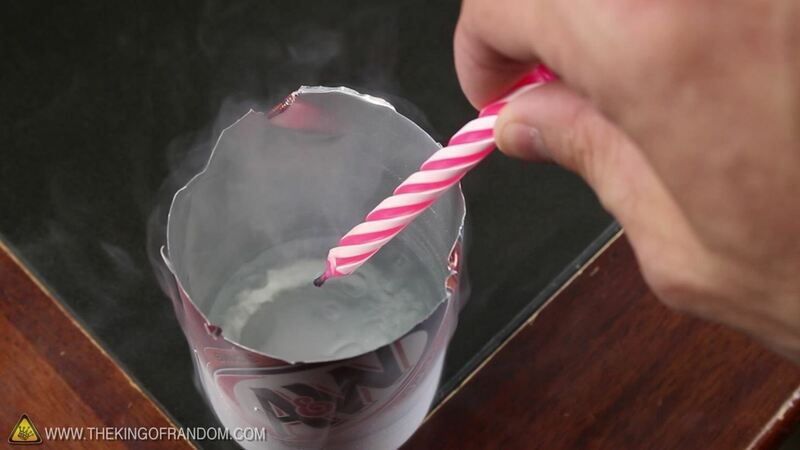 Save one of the candles from your birthday cake and hold it over the can. 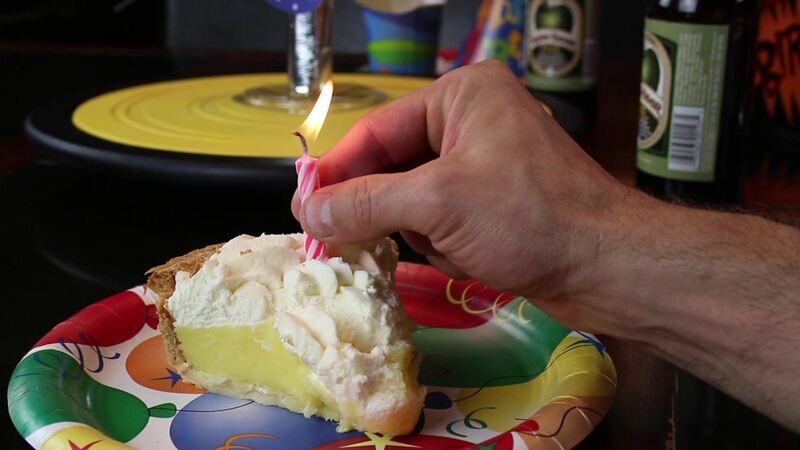 You'll notice that this time, the flame actually gets brighter. 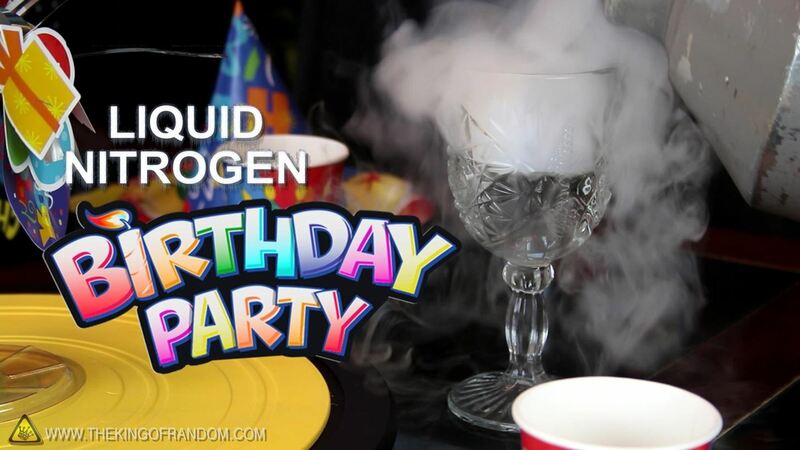 This is because the nitrogen has evaporated and left the oxygen behind. 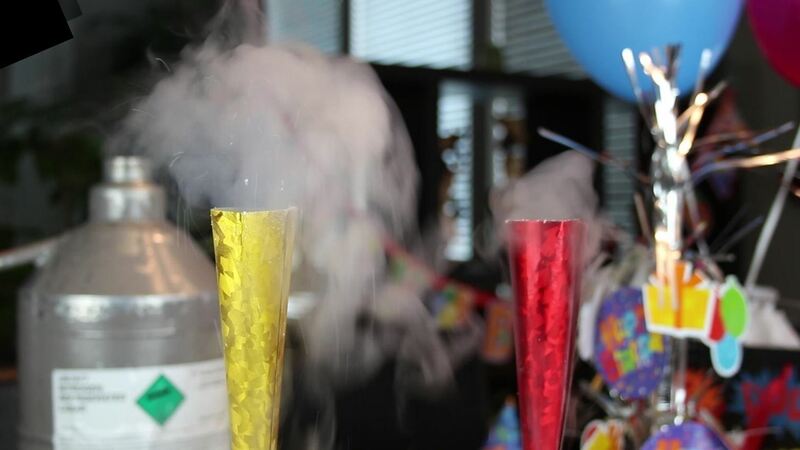 Pure oxygen is extremely reactive, and if we drop a candle down into the liquid, you can see it gets so hot, that the metal can actually melts in just a few seconds. 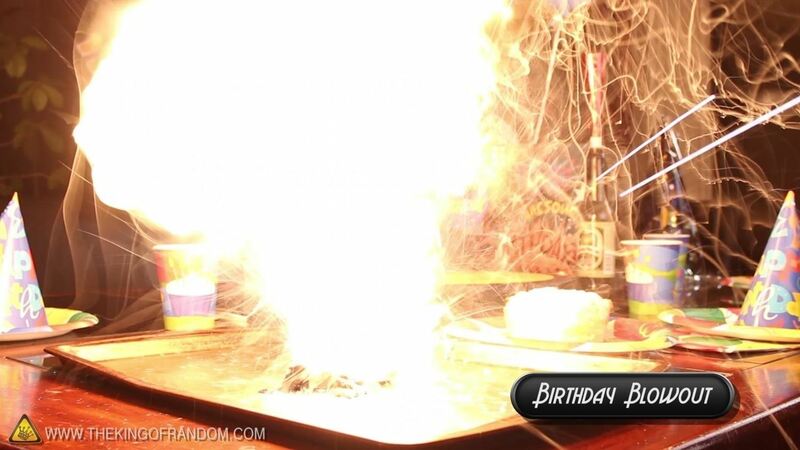 Then explodes, spewing molten metal all over the place. 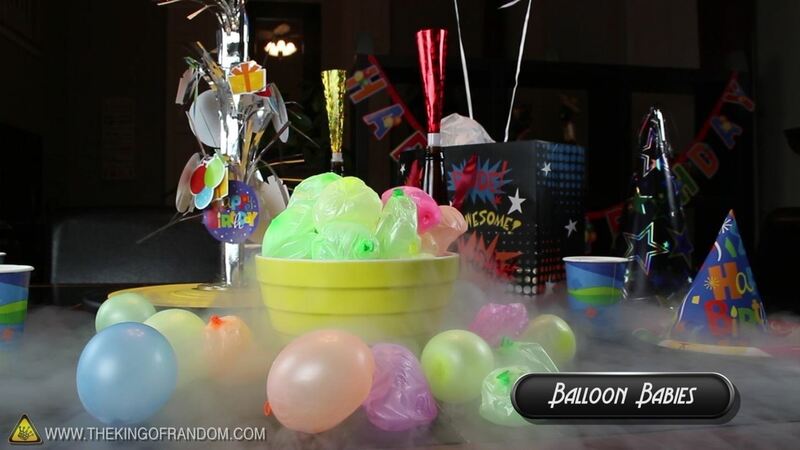 This is a trick that should be done outside, keeping the safety of you and your guests, as a top priority. 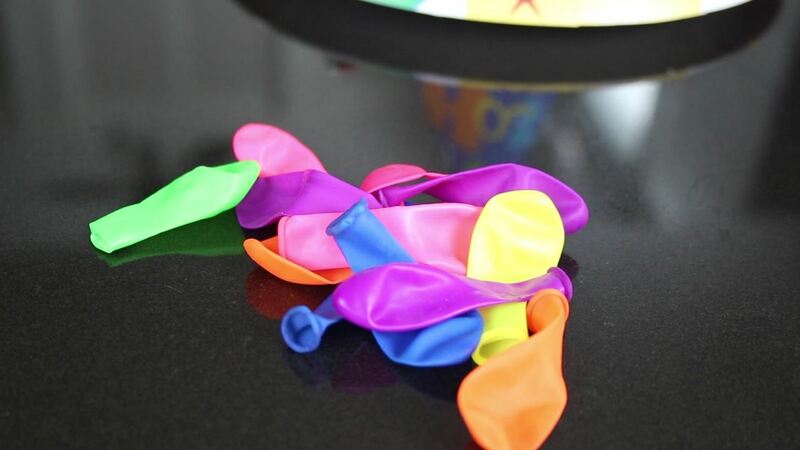 Blow up a bunch of little party balloons, and soak them in a container of liquid nitrogen so they shrink down to nothing. 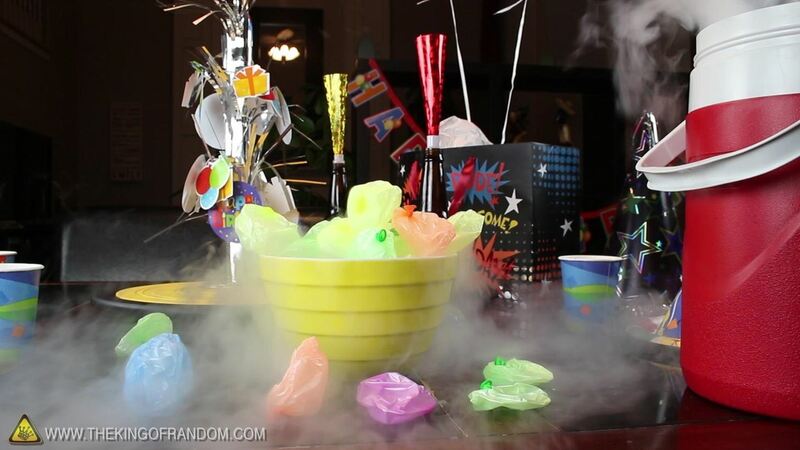 Then quickly scoop them all into a bowl, and stand back to watch the magic. 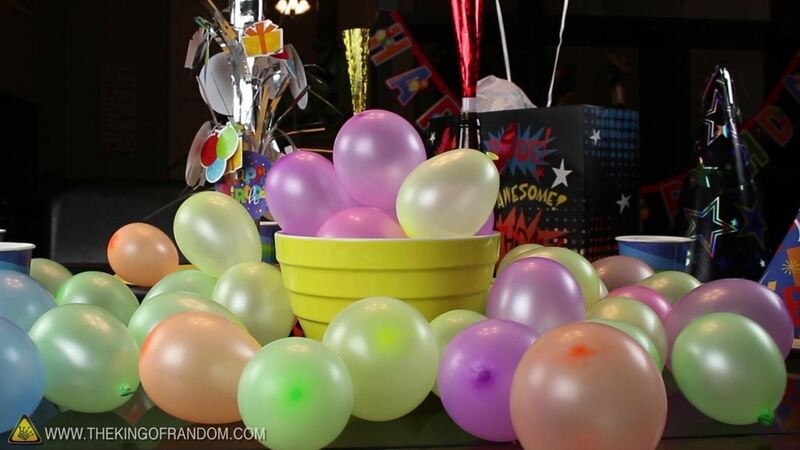 Rising from a layer of mysterious flowing fog, your little balloon babies begin to grow right before your eyes, spilling over and covering the table. 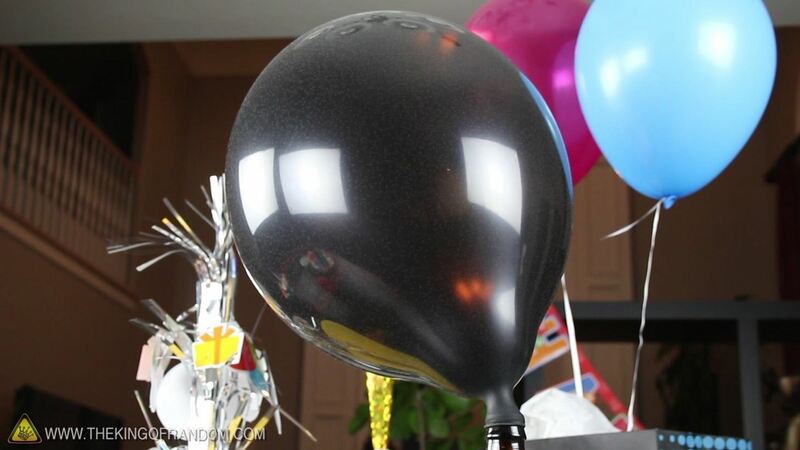 Fill one of your small balloons with helium, and shrink it down in liquid nitrogen, like you did the others. 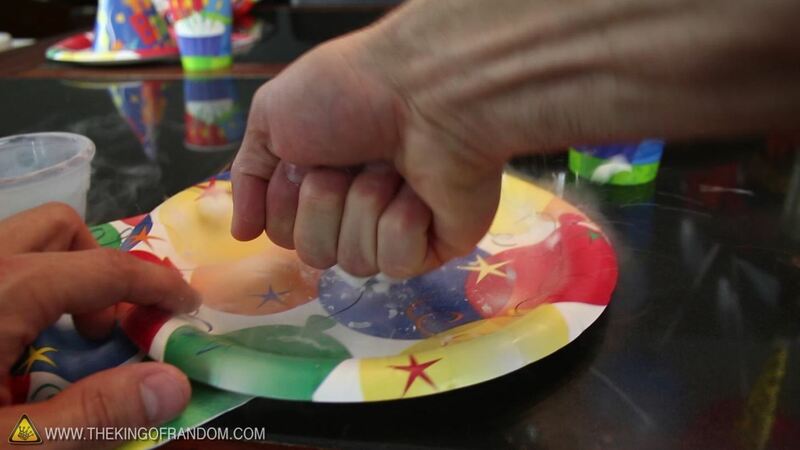 Scoop it out and place it down on a table to see what happens. 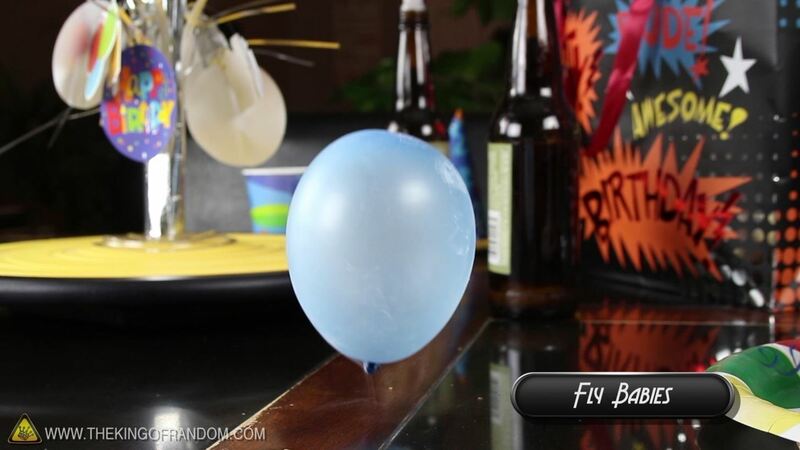 You'll notice that after a few seconds, it suddenly pops upright, then takes off like a little UFO. 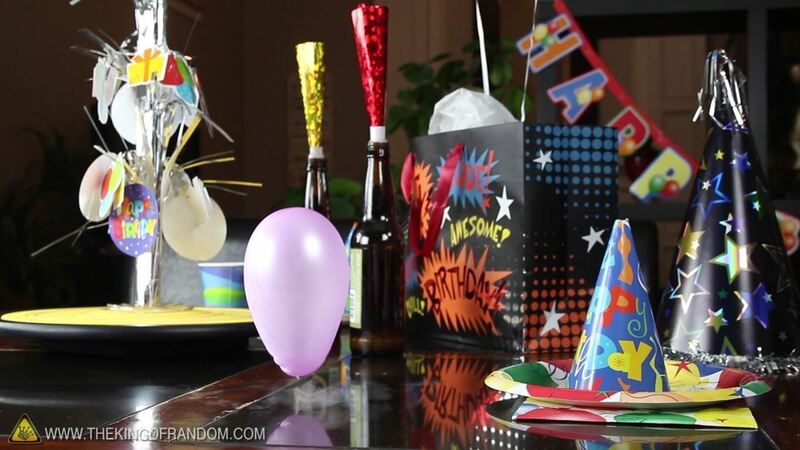 Your friends should be impressed, to see your little creation grow up, spread it's wings and begin to fly. 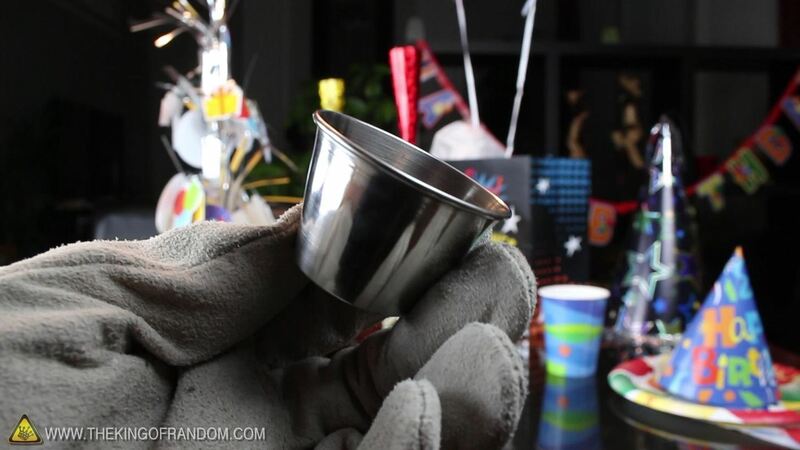 For this last trick, we'll need a shot glass, or a small condiment cup like this. 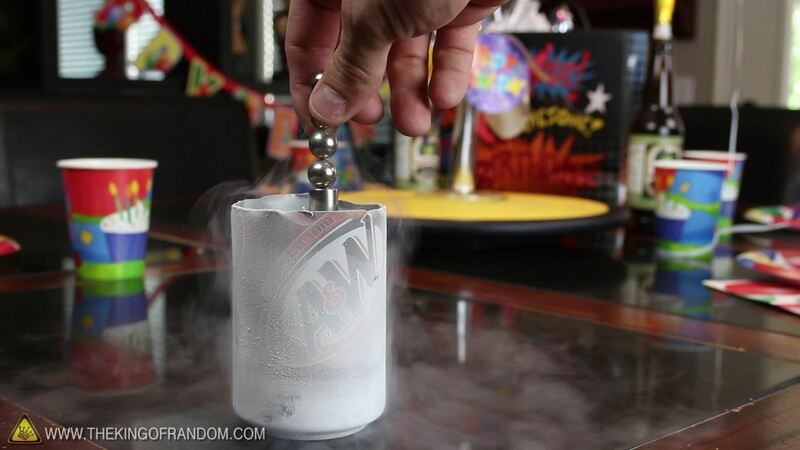 Pour in a tiny bit of liquid nitrogen, and get ready to put it in your mouth. 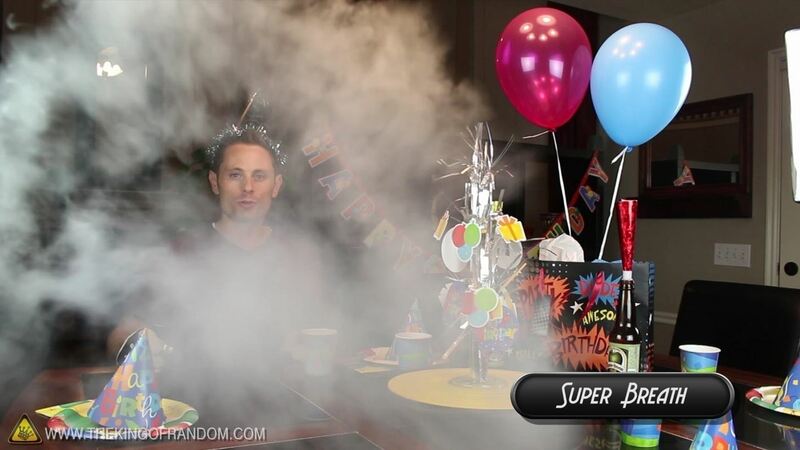 As long as you spit it back out immediately, you'll gain the Kryptonian power of super-breath. Just make sure not to swallow, or take too long getting it back out. 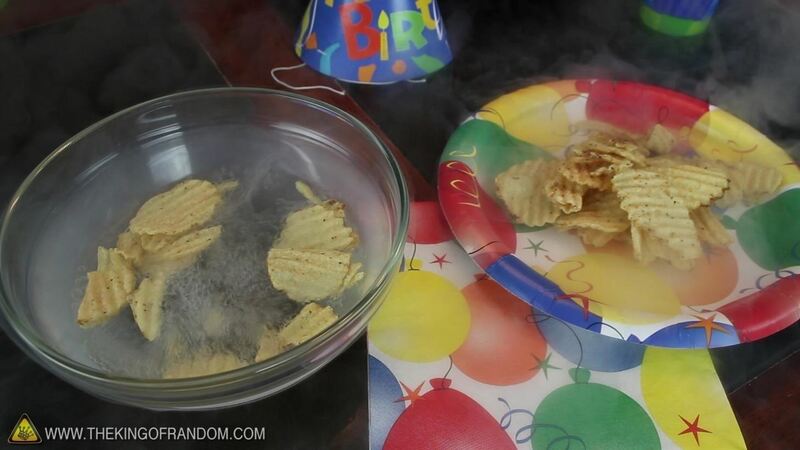 That probably wouldn't end well. 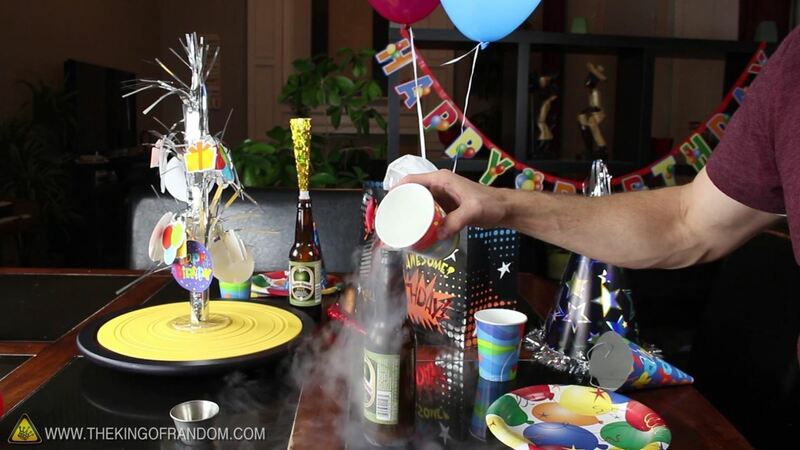 Well now you know 10 different things do to at a birthday party with liquid nitrogen. If you liked this project, perhaps you'll like some of my others. 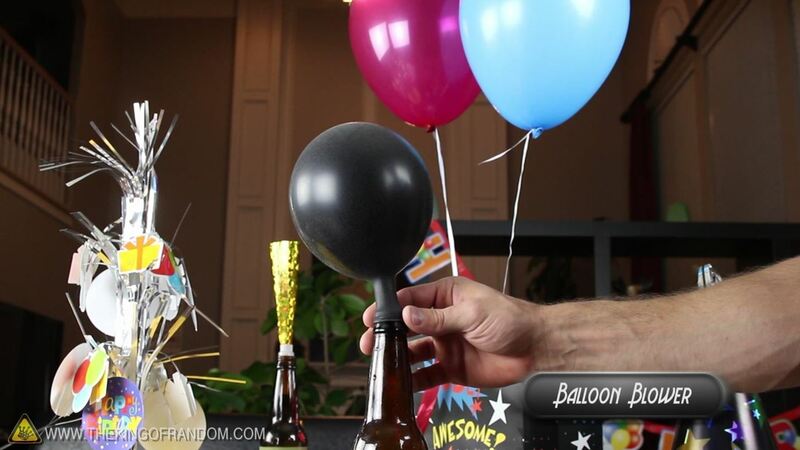 Check them out here on WonderHowTo or over at thekingofrandom.com.